A dental implant is the best replacement option for addressing missing teeth. An implant is dimply a titanium cylinder gently placed into the site where your original tooth once stood. After a short healing period, we fit the implant with an abutment that holds a natural looking crown in place. After that, you are free to eat the meal of your choice with little to no restrictions. The entire procedure is done with your comfort in mind. Some patients simply prefer to have a local anesthetic during the treatment, which in many cases is more than satisfactory. Others opt for sedation, where you are given a medication that will allow you to remain clam and relaxed and have no memory of the treatment. Sedation is a great choice for patients receiving multiple implants. We’ve often been asked if an implant is as strong as the original tooth and if the implants will remain indefinitely. The answer to both questions is a resounding “yes”. Implants are as strong or stronger than the original tooth and the longevity can be indefinite provided you maintain basic, at-home oral hygiene. Besides single tooth implants, we also offer multiple implants for those who have lost most or all of their teeth. Multiple implants are comfortable, stable (no slippage! ), and look terrific! If you are interested in learning about your dental implants options please contact us to schedule a free consultation. We will be happy to address your concerns and discuss the available implant options. A member of the American Dental Association and Academy of General Dentistry, Dr. Michael Flynn has been providing comprehensive dental care to adults in the Milwaukee/West Allis areas for over 25 years. Committed to advancing his implant knowledge base, Dr. Flynn has completed numerous implant continuing education courses both here in the U.S. and in Europe. Dr. Flynn is dedicated to providing you with the most up-to-date implant treatment plan to help you achieve the smile you desire. Dental implants can help you preserve the long-term health of your smile as well as its appearance by replacing the roots of your lost teeth. 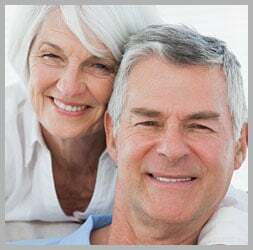 To find out if you qualify for implants, schedule a free “get acquainted” appointment by filling out our online form, or by calling our office in West Allis, WI, at 414-541-8250. We proudly serve the residents of West Allis, Brookfield, Wauwatosa, and all Western Milwaukee communities.